Javelina have become a problem in certain areas of the United States. They are ferocious eaters, populate quickly and have a negative impact on most all animals as well as the local environment. Javelina can be a problem in and around any home. 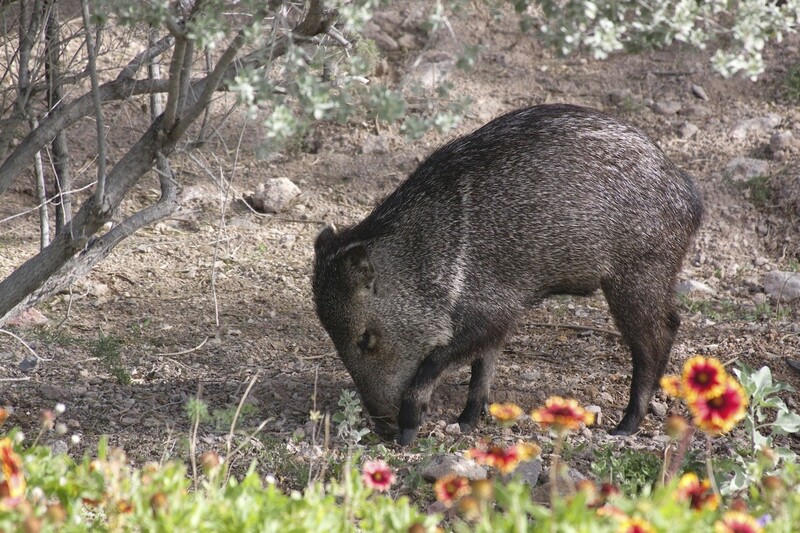 4) When natural food isn’t available, Javelina will forage on local gardens or crops. Their impact can be fast and extreme resulting in tremendous losses to any farmers harvest. 8) They can be dangerous. Though mostly shy, Javelina have been known to attack people or domestic animals. There are a few javelina repellents that can be used to keep them out of the yard when local problems are small and not too extreme. These include bad tasting liquid sprays, sound and water sprayers. For mild feral javelina problems where you’ve found them rooting your yard, you can try using DEER OFF. This “bad tasting” agent can be applied to the turf, grass, shrubs, bushes or flowers. 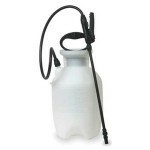 Created for deer and rabbits, Deer Off is mixed with water and then sprayed using any standard PUMP SPRAYER. It’s been found to work on javelina as long as there aren’t too many around and there is an alternative food supply available close by. Another device that will scare them off is the MOTION ACTIVATED WATER SPRAYER. Basically these units are set out in areas of the yard where javelina are active or trailing. 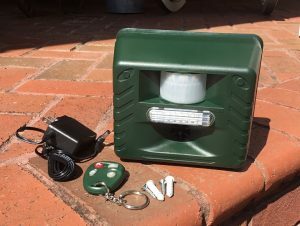 These devices have motion detectors and once turned on and hooked to a water supply, they can protect an area in the yard that is being targeted by local javelina. Once the javelina walk into the range of the sensor, water will start spraying out for about 3 seconds. It will then reset itself and be ready to spray again in 10 seconds. It has an effective range up to 40 feet away and can protect up to 2000 sq/ft per unit. Javelina are normally very skittish and sensitive to anything abruptly spraying water or making a hissing sound making this unit highly effective. Lastly, installing ULTRA SOUND REPELLERS is another option which can be used around your property to keep them away. These devices work because javelina are naturally sensitive to ultrasound, audible sound and flashing lights. Our devices will send off ultra sound by default along with flashing a strong LED light bar. 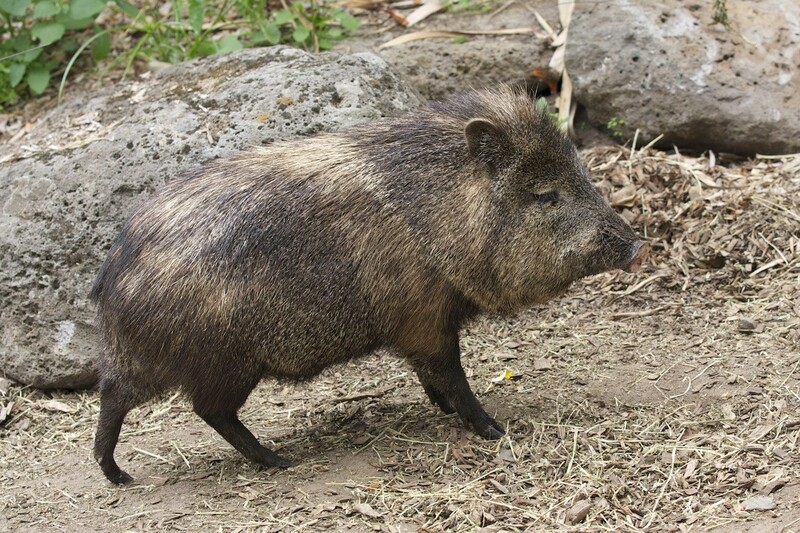 They also have an audible sound which is scary to most any nocturnal animal including Javelina. Other features of our machines is that you can set them to operate at night only as well as turn the audible sound completely off if you don’t want to annoy neighbors. The Ultra sound is effective for up to 70 feet and when the included AC power supply is used to power them on, you can run them all the time to increase their range. When set to motion detector only, they’ll work fine but will not set off until the javelina walk within 30 feet of the unit. The audible sound is quite loud and can be heard for up to football field away. These units are weatherproof and should be placed along property borders or where the javelina are rooting. The best javelina settings is to set Operating Time to “night”, the Ultrasonic to “constant” and to power them always on using the included power supply. But you can also use them with the Ultrasonic set to “Motion” so it will only turn on when activated by intruding javelina. Again, you will need to have the unit within 40 feet of the intruding animal and about 3 feet off the ground for it to work best. In either case, set the Sonic Volume to “80-100”. Lastly, the frequency (yellow knob) should be almost all the way to the left. We recommend trying to power the unit using the included AC converter for at least two weeks and then after that, running it on batteries using the “Motion Sensor” will be enough to keep them away for good. Because of the problems associated with wild Javelina, farmers and land owners will many times have to remove local javelina from the environment. Javelina can grow large and because of their size and shape, there aren’t many options available for managing local nuisance animals. There are no registered poisons and the only proven method of controlling this animal is with a trap. 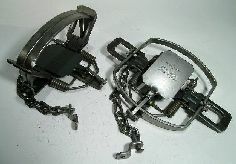 There are two kinds of traps commonly used for javelina. Known as “leg-holds”, these are styles that have long been used by traditional trappers who hunt beaver, mink, muskrat, etc. These devices work by “catching” target animals on their legs. Trap sets must be made where the Javelina are known to be active and foraging. Depending on the size of the Javelina targeted, use either COIL #3 or COIL # 5 traps. 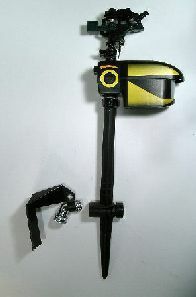 These are the easiest to set and need to be placed along their walkways and trails. Be sure to “anchor” them to large stumps or better yet, live trees. Javelina are quite strong and will easy pull up common trap stakes. 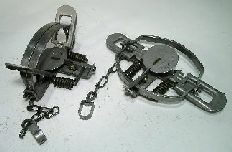 The more traditional Javelina leg hold trap is known as the Longspring. It’s a bit more difficult to deploy but works just as well. 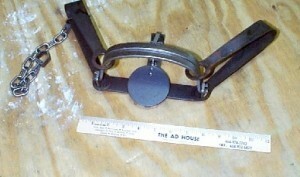 Again, animal size will determine the trap size needed. In most cases, a LONGSPRING # 3 or LONGSPRING # 5 will do the job. Javelina can grow large and are quite strong. For this reason leghold traps must be anchored to a big, strong tree to insure the traps aren’t taken away by animals getting caught. You can attempt to use a dead log but several cinder blocks will usually do the job too if no tree is present. 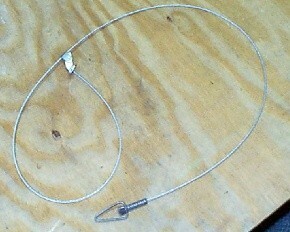 Another way to trap javelina is to use heavy cable SNARES. You’ll need our heavy duty model strong enough to hold both mountain lions and bears because Javelina will test the strength of the cables like any large animal. Use these like leghold traps; place them in pathways or trails where javelina are active. Bait is not needed to make a set and in most cases, target animals will be caught by the leg or head. Like the leghold traps, you must anchor your snare to a large, mature tree to insure the cable isn’t hauled away. Lastly, another effective method of catching Javelina is with a live trap. Well suited for small numbers of animals, this trap is large enough and strong enough to contain any animal that enters. To ensure success, place the trap in an area javelina have been active. Line the trap floor with common ground cover like pine straw, sand, grass, etc. The goal here is to conceal the metal cage floor so they do not detect it. Partially covering the trap with tree branches, shrub stems, local plants that vine like kudzu or some other vegetation can help too. 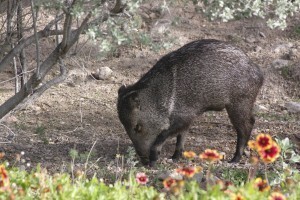 Javelina have made a big impact on regions where they are now established. If you have nuisance javelina that need to be removed, you’ll need to do some trapping. Leghold or snare type traps can work but The Javelina Trap is probably your best option for long term maintenance and population control. I have heard that coyote urine is a deterrent to javelina. Do you know if that’s true and if so, do you sell it? Thank you! We sell a lot of coyote urine and the bulk of it is used to repel a wide range of animals. That being said, I don’t believe its the best option for javelina. I say this because we’ve heard mixed results from customers who’ve tried. Overall, I’d say maybe 50-50. But if you want to try, our coyote urine is all natural and super concentrated so its as good as it gets. Now if this doesn’t work out to your expectations, I suggest going with some Timber Wolf or Mountain Lion Urine instead. Its a bit more pricey but tends to work better on animals like javelina.